Perhaps the most criticized issue that can be found in Tree of Savior is the often times frustrating client optimization that causes drastic and dreadful lag issues and dropped frame rates. In the game’s latest Developer’s Blog, the staff presented the results of their Client Performance Optimization efforts so far. They recorded densely populated maps in three different variations comparing before and after the Client Performance Optimization patch. The difference is almost night and day. ArtCraft is showing off lots of new exciting features and content for Crowfall focused on exploring the newly finished map, Wrath. Wrath’s landscape is diverse and is the first map to feature new PvE areas called “Adventure Zones” like the Spider Canyon where players can hunt giant spiders and face a world boss for valuable loot. A new system for player death and recovery was put in place. If a vessel’s health reaches zero, it is knocked unconscious. Players can be resurrected by a Cleric, Druid or Templar or be finished off with a killing blow. The Korean version of Closers has just revealed several exciting news coming to the game in the summer and beyond. Keep in mind that while En Masse’s English version is releasing characters at a good pace with Tina’s release only three days ago, the original Korean version is still more than half a dozen characters ahead with even more coming soon. This is very exciting news and gives Western players even more to look forward to. Closers (KR) as of now has 13 characters and Nexon has revealed that the 14th addition to the roster will be released in July! The class name will be Mystic, but a character name has not been revealed yet. Based on the silhouette below, it’s highly likely that the character is a girl. However I wouldn’t go as far as to say it’s certain since there are existing characters that would be very difficult to label with only a silhouette like Misteltein. Likely in response to the massive player protests from the North American region that occurred several days ago in regards to server instability and constant lag issues, Black Desert Online will be switching service providers towards the end of April. Will this finally calm the masses and ease the tension building up within the Black Desert community? Only time will tell. The North American servers will be taken down to initiate the migration process to the new Service Provider and the NA servers will also be utilizing Level 3 Communications as the primary carrier. Two other carriers will be working alongside them to support network stability. All of this comes with Database server upgrades for improved performance. We’re just a bit over a year into its open beta and now My has applied French and German localization to the Western version of Revelation Online. The game’s interface has been resized to better fit the changes to each language of choice. 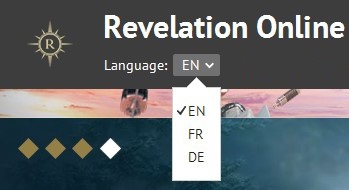 Why does Revelation Online need to be playable in French and German languages? Beats me. Perhaps the corresponding regions for them have massive presence in the game, but our community reports that population is at a low point for this recently released Chinese port. Before joining the game’s servers, check to see if you are launching the game in the language you want through the drop down menu in the Game center page. The language options are available on all live servers. Blizzard announced that Battle for Azeroth, the next World of Warcraft expansion will be released on August 14, 2018. A new trailer showcasing previews of the story behind the continuation of the fight between The Horde and The Alliance after the events in the Burning Legion. You can pre-purchase the Battle for Azeroth expansion now on battle.net. You can also get the physical collector’s edition of the expansion on the main Battle for Azeroth teaser page. ArcheAge 4.5 will be updated to live servers today with two new fresh start servers and new events like Shadow Invasions, dragon mounts and more. A new trailer has been published for 4.5 Legends Return update, but it’s hard not to notice that most of the footage are re-used from other trailers. We’ve covered the upcoming changes coming with update in more length in a previous post, but you can also find all up-to-date information on Update 4.5 and the fresh start servers on the official Trion site page. Servers will not open any earlier than 4 PM PDT.